Anyone else have a little bit of stress in your life? My life is a little crazy right now. We are building a house and farm, getting ready to move. We are also going on vacation. With 4 kids. It’s getting real, folks. This recipe is using this month’s Oil of the Month from Plant Therapy – Kumquat! I just love this zesty little oil. If it had a personality, I’d say it’s very much like my sweet, extrovert 5 year old daughter. Bubbly, exciting, ready to play, but always thinking of others. This recipe is perfect for stress. 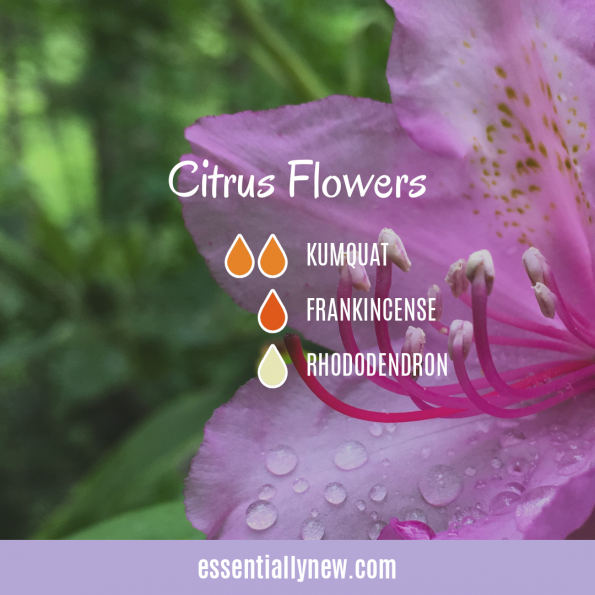 The frankincense and rhododendron calm the mind, while kumquat keeps you focused and helps make your mood a little more bubbly. Blend and add to diffuser. This one would also be a really nice perfume blend. Just mix in a roller bottle and top with carrier oil. You can double the number of drops, but I wouldn’t use it as often.